Easily find the right chord voicings, filtering them by difficulty or inversion, and list all the modes you can play over. 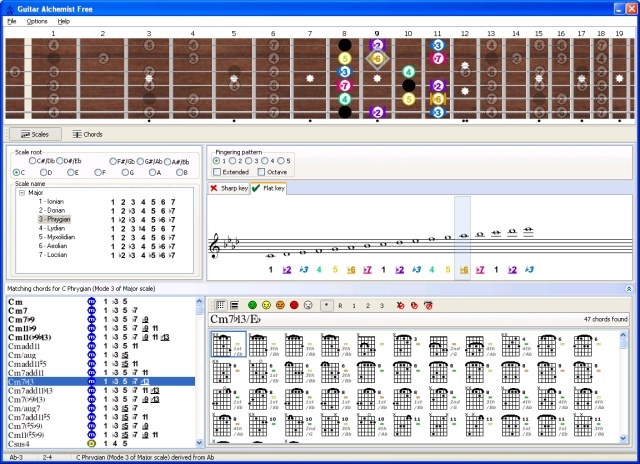 The fingerboard can be configured (Left handed players, background texture and other features). The theme of the application and MIDI settings can also be customized. With this program, guitarists of any level attachs can now attach meaning to music ! The scales are displayed on both the fingerboard and the staff. "This is a great program, it saves you tons of time and energy." As I said, this is great, instead of guess and check, or a book of theory, you can see chords and how they relate to scales. "That's the end of chordbooks"
I have all these chordbooks that I don't need anymore. This is WAY better. "I'd just like to say what a great piece of software this is. Thanks so much, it's really helped satisfy my hunger for knowledge of corresponding chords with modes. Keep up the good work!"